Have fun customising your own clothing using our great range of icons, including over 250 designs! Add your own personalised touch using a name or a favourite quote, perfect for the whole family! Please note that every item of clothing is printed to order so we'll ensure your design fits perfectly to best suit your chosen style. Our collection of baby and toddler apparel features cute and fun designs that both parents and children will love! Please measure using our size chart to ensure proper fit. Most of these pieces are made from a 100%* cotton, giving them excellent comfort and breathability properties. With our bright and vivid printing, our shirts result in a professional and fresh appearance that is guaranteed to last. *Baby t-shirts contains 95% cotton 5% elastane to give it extra stretch. What sizes do you have available? Please click the 'Description' tab to see a complete size guide. 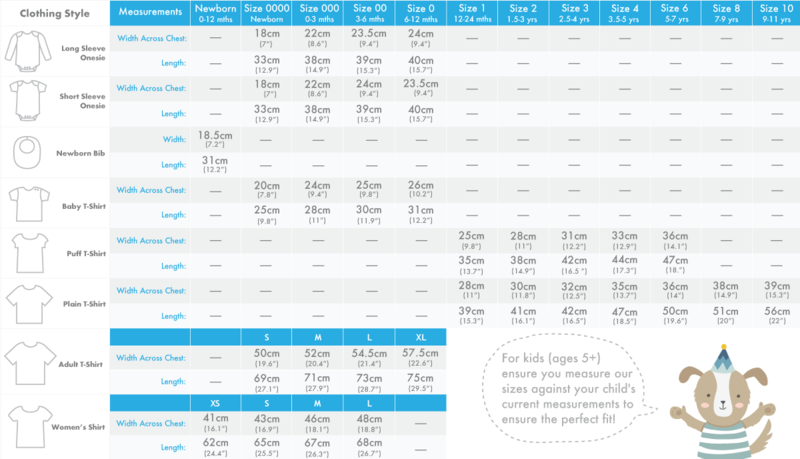 As each child varies in size we recommend you measure your child and choose a size based on our width and height measurements displayed in our size guide. You can choose from a range of baby and kids clothing styles, which are all 100% cotton. Each piece of clothing is printed on demand, directly on to the garment so it blends seamlessly with the fabric. For personalised clothing, we will ensure every name is scaled to fit perfectly on each design to suit your exact requirements. If you'd prefer to not have a child's name on your order, simply write 'Leave Blank' instead of a name and we'll do just that. How do I wash my personalised clothing? To keep your clothing looking great we recommend that you wash them using a cold wash cycle. They shouldn't be bleached or put into a tumble drier, but you can use a dry warm iron on the reverse of the print to keep them wrinkle free.